There’s something a little messed up with my priorities. I watch a show for review on DVD, and if I fall in love with it, I’ll order it on Blu-ray then and there, while it’s still fresh in my mind. But when I come to watch it again, so much time will have passed, that it will probably have been on discount or in a bargain bucket on two or three occasions. I loved Watamote when I watched it, and bought the Blu-ray straight away. It’s been almost four years and I now get to watch it again, experiencing the HD version for the first time. Still, enough time will have passed for me to be able to re-evaluate the show as if it’s fresh. But I really need to stop being so spur of the moment about these things. Watamote features as its main character a social recluse trying to overcome her introverted nature to become a functioning member of society. The danger of such shows, shows like Genshiken and Welcome to the N.H.K., is that they risk alienating their target audience by holding up a harsh mirror. Let’s face it, everyone had their moments of social awkwardness at school, but not everyone wants to be reminded of those painful memories. Shows like Watamote have to walk a fine line between making the audience laugh, and making them cringe in embarrassment. Watamote is short for Watashi ga Motenai no wa Dou Kangaete mo Omaera ga Warui!, which is where the No Matter How I Look at It, It’s You Guys' Fault I’m Not Popular! comes from. 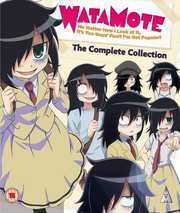 Twelve episodes of Watamote are presented on two Blu-ray discs from MVM. Watamote gets a 1.78:1 widescreen 1080p transfer. The image is clear and sharp throughout, with no significant sign of aliasing or compression. Digital banding is kept to a minimum, and the clarity, strength of colour, and detail all serves to show just how much of an improvement over the DVD the Blu-ray actually is. The character designs are pretty simple, with the majority conforming to the norms of anime. With Tomoko however, they somehow manage to geek her out while maintaining that simplicity, heavy lidded eyes, sallow complexion, and bags under the eyes from too much videogaming. Detail levels are good, and the world design is effective, while the animation too is fluid and perfect in conveying the main character’s state of mind through expression and action. 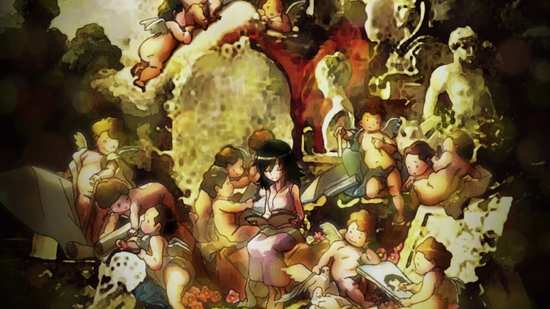 It is a well worn setting, that of a high school in modern Japan, but Watamote does enough to make it stand out among its peers. You have the choice between PCM 2.0 English and Japanese with locked (white) subtitles and a signs only track. This being a Hanabee re-author, you can choose between subs and signs for either language track from the menu screen. The dialogue is clear, and while it isn’t an action heavy show, the effects and music come across well, with a nice bit of stereo placement. And with this being the Blu-ray at the correct frame rate, we don’t have to worry about PAL speedup or pitch correction. It’s basically Tomoko’s story, told from her point of view, with a fair bit of inner monologue and voiceover. The lead actor has to carry the show, and the Japanese actor, Izumi Kitta creates a distinctive and memorable character. Her take on Tomoko is vivid and unique (there are a lot of social outcast characters in anime these days), and Tomoko has a different ‘voice’ for when she’s on her own or with someone she can be herself with, in an awkward situation, or in one of her fantasies. I’ve read a lot of positive opinion on Monica Rial’s take on the character for the English dub, and she does go in a direction I haven’t heard from her before. But I have heard Monica Rial’s voice a little too often in anime, and she just sounds like Monica Rial to me now. The subtitles are accurately timed and free of typographical error. The show comes in a BD Amaray case, with one disc on a central hinged panel. The inner sleeve has the episode listing. 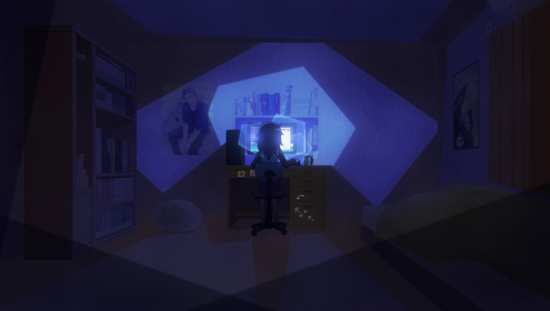 Watamote is presented on two discs with static menus. Each episode is followed by a white text on black translated English credit reel. The extras on disc 2 amount to the textless opening, six textless closings, and trailers for Patema Inverted, Fate/kaleid liner Prisma Illya (which took me longer to type than to watch), and Devil Survivor 2. I think everyone has had at least one embarrassing, dysfunctional moment during adolescence, where they said, or did the wrong thing, wore the wrong clothes, or just tried too hard to fit in, and made a mess of things. For the majority, it’s one moment that they cringed about at the time, but can now laugh off. But for some, that sense of being an outsider, socially awkward, not fitting in, was and is a permanent state of being. I remember one guy in college, missing the tact filter between brain and mouth, long unkempt hair, always in a long dark coat, who had a habit of grabbing people’s attention by slowly poking them once in the arm with one (long nailed) finger. He managed to creep everyone out doing that. But in every respect that actually mattered, he was harmless, soft spoken even. 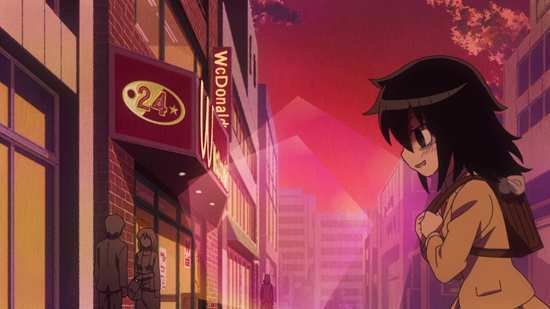 Tomoko Kuroki embodies the worst aspects of this kind of social awkwardness and being an otaku outsider, turned up to the max. But more than that, Watamote tells its story from her point of view, gets inside her head. When you break it down, there are shows that do the same things as Watamote, and do them better. If you want the pop culture references, and otaku chic, there’s Genshiken, if you want whole girl otaku experience, there’s Princess Jellyfish, and if you want the social pariah, awkwardness and angst, there’s Welcome to the N.H.K. Watamote does all three though, and it does more besides. It also does something I have rarely seen, audience development. 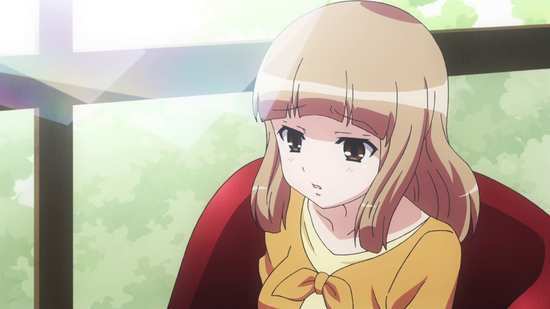 Most stories and shows offer character development and story arcs, but Watamote manages to take its audience on a journey, and manipulate the way they see the show and the character over its 12 episodes. It is a lie that popular culture tells us, that all it takes is a quick makeover and bit of confidence to turn even the mousiest of introverts into prom queens. But you see it all the time on TV and in anime, the quiet bookish girl in the corner, who makes hearts melt as soon as she takes off her glasses and flicks her hair. The reality is far crueller; the introverted girl will try a change of image, fall flat on her face, be laughed at, and will thereafter retire to her corner, never to try again. Because no makeover or five minute ego massage is going to change a personality, it’s not going to cure neuroses, or instil the social skills that a functioning member of society needs. 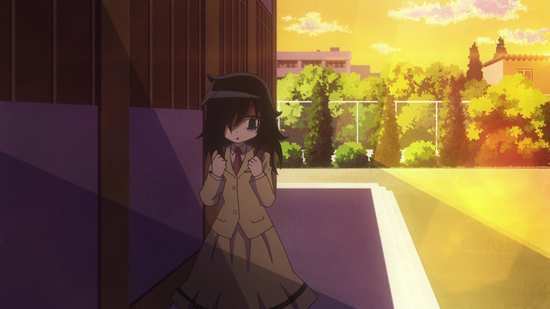 Tomoko Kuroki has obviously seen those shows and movies, as she is determined to fit in, to be liked, to be popular, and she’s all for the quick fix, even though her underlying personality remains constant. She was the outsider in Middle School, weird and an otaku, but that was okay, because all it took was one friend to be comfortable. She had her best friend Yuu, also an outsider, and they had their own little world. 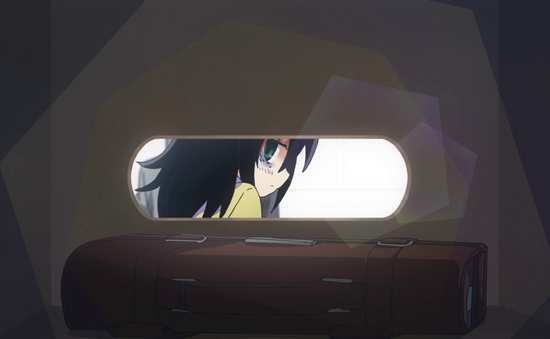 But starting high school without Yuu, Tomoko knows that she has to fit in if she’s to be popular, but she’s still an otaku, spending more time online, reading manga, watching anime, playing dating sims, than actually interacting with other people. Because she recognises those differences in herself, she also has a superiority/inferiority complex going. She thinks everyone else, with their mundane concerns about friends and about dating and about being ‘cool’ are beneath her, but part of her recognises that because of her interests and personality, she’s not ‘good’ enough to be part of that crowd. So it is that her inner monologue can be opinionated and disparaging of the people around her, but she’s shy, stammering, and closed up when she tries talking to anyone outside of her circle. Her circle incidentally consists of her family, and Yuu. At that age, her parents naturally are alien, while she uses her brother as practice for interacting with people, but he thinks she’s just a pain. What’s worse is that when she hooks up with Yuu again, Yuu has made the transformation from outsider to ‘normal’ teenager that she can’t. Yuu even has a boyfriend now. 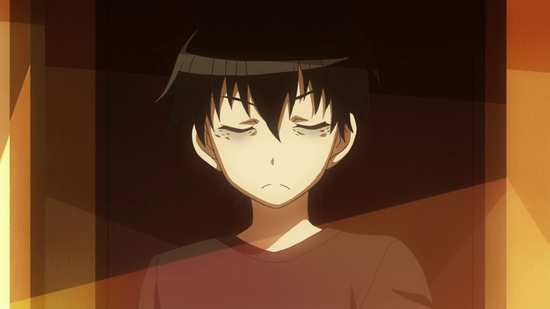 There is a bit of a Sayonara Zetsubou-sensei approach to the humour in the show, a one-note style especially in the early episodes, where Tomoko inner monologues a rant about the people around her, only to have to then interact with them and then fall flat on her face, but it only takes a few episodes for Watamote to broaden its range. 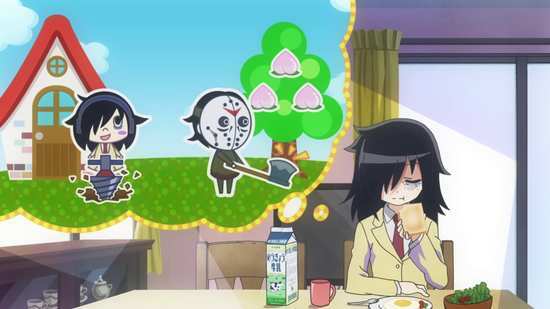 It follows Tomoko as she comes up with ever more bizarre ideas to try and become more popular. Trying a change of image is just the start, trying cute underwear for confidence, trying an anime character style, trying to go with her strengths and becoming a videoblogger, trying to contribute at the school cultural festival... This is balanced with her complete, paralyzing panic whenever she has to interact with someone, whether it’s talking to a teacher, or another student. She either ends up stammering her way into silence, or says the wrong thing completely. To balance this out, we also get to see her inner fantasies, where she’s tall, attractive, with great complexion, and confident and liked. At first they’re just far-fetched flights of fancy, but by the end, she’s fantasising about normal situations turning out right for her, and there’s even a point where I suddenly thought that for once, she’d managed to succeed in something, so small and mundane was the fantasy. The reality of the show is that Tomoko never succeeds, even though she keeps trying. This is because the show recognises a fundamental truth about social awkwardness and being an outsider. Ninety percent of people who suffer from social withdrawal won’t be able to change. The best that such people can hope for is to find a niche in society, a place to belong, and that place won’t be the unending popularity contest of high school. While Watamote won’t be a satisfying series for its protagonist, it still manages to be a satisfying show for the audience, because of that journey that it takes them on that I mentioned earlier. 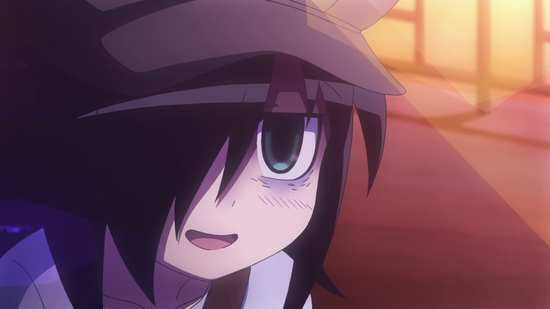 I certainly found myself laughing at Tomoko’s antics early on in the show, the half-baked ideas that she comes up with and the situations she gets into are very funny. But as the show progressed, it certainly nudged enough of my own adolescent memories of awkwardness to balance the laughter with cringes of embarrassment. 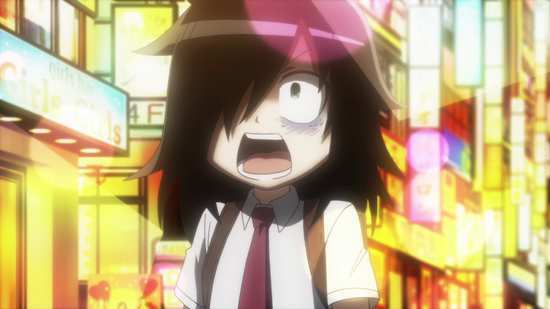 But the more time the series spent with Tomoko, relating her painful need to be accepted, and her constant sabotaging of her own efforts, that I really began to feel for her. By the end of the show her attempts to fit in were engendering as much heartache as laughter. You just want something to go right for Tomoko, and I’ll even admit to a little moistness in the eye at the scene with the hug and balloon from a mascot. It’s the same old argument again. I always want the shows and movies that I like in the best quality possible, and for Watamote, that’s definitely with HD resolution and uncompressed audio at the correct frame-rate. This second time around, the slow burning nature of the show was even more apparent, with the early episodes feeling thin and lightweight. 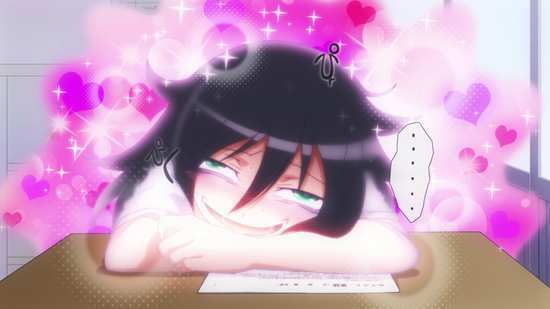 You really do have to get to know Tomoko, understand her character, and develop some empathy for her before the show really starts to gel, but if you can do that, Watamote is one of the best shows of its rarefied genre.